Two Conferences in Two Weeks! and Janet Dean at ACFW 2010. Writing is a solitary business, but each fall two conferences – held only two weeks apart – pull me away from my computer and allow me to interact with others. 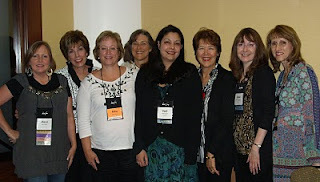 On September 16, I flew to Indianapolis, Indiana, for the American Christian Fiction Writers Conference. The Friday to Monday event was packed with workshops on craft and technique and provided numerous opportunities to learn how experts create their stories. Hollywood Screenwriting Guru Michael Hauge gave a two-part class on Plot Structure. Initially he worked with screenwriters to help them enhance their scripts. A few years ago, he began speaking to writers groups and soon realized the same techniques apply to full-length fiction. Using examples from movies, Hauge described the six stages that take a character from his or her ordinary world through a series of escalating complications, which result in changing the hero or heroine, to an exciting climax where the lead character faces his biggest obstacle. In the end, the character is a new and hopefully better person because of what he experienced. 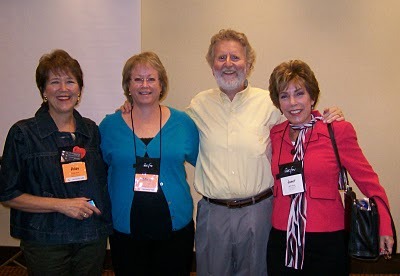 Interestingly, Mr. Hauge is also presenting at the Georgia Romance Writers Moonlight and Magnolias Conference, which I will be attending this upcoming weekend. No doubt, he’ll provide even more information for me to absorb and apply to my own writing. Debby Giusti, Glynna Kaye and Myra Johnson. The highlight of both conferences is reconnecting with friends. Many of the Seekers – 15 of us began as a group of online friends all working toward publication…for the last three years we’ve blogged about our experiences (http://www.seekerville.blogspot.com/) and celebrated when doors opened and our books sold—were at the ACFW conference so it was especially wonderful to get together with them. The Georgia writers are a warm and welcoming group, and I’m excited about seeing many dear friends this weekend as well. I’ll return home on Monday and head back to my computer. Hopefully, my writing will benefit from the workshops I’ve attended. I know I’ll have wonderful memories of the friends I cherish that will carry me through a winter of writing. Visit Seekerville (http://www.seekerville.blogspot.com/) for our October Birthday Bash. Great blog interviews, lots of fun and giveaways, including a Kindle loaded with Seeker books! Be sure to stop by on October 5th when Steeple Hill Assistant Editor Emily Rodmell will provide tips on getting published. Hourly drawings, including the four September Love Inspired Suspense releases!